Modern body armor has the armies of the world rethinking their pistol rounds. 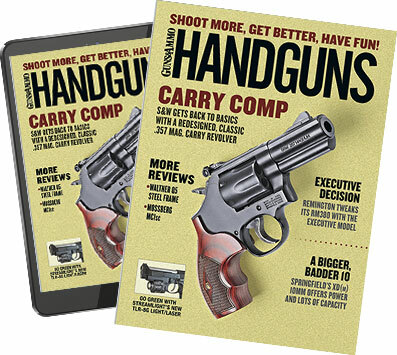 At the dawn of the 21st century, service pistols face a new challenge that threatens to render them all but obsolete: Body armor capable of stopping standard service pistol cartridges is becoming widely available. Currently there are two trends in military handgun ammunition to address this growing concern. One is the development of small-bore, high-velocity, armor-piercing rounds. These are capable of penetrating soft body armor but have questionable terminal performance. The other is an attempt to extend the life of the 9x19mm through the development of modern armor-piercing loads. Both approaches are an attempt to keep the standard service pistol a viable weapon on the modern battlefield. Although perhaps adequate when it comes to soft body armor, no military handgun ammunition is capable of defeating current hard plates. Developed by the Soviet Union in the 1970s, the 5.45x18mm 7N7 cartridge was the first of the modern small-bore military handgun rounds. A tiny bottlenecked round, the 5.45x18mm was designed specifically for the compact Pistolet Samozaryadniy Malogabaritniy (Pistol Semi-automatic Miniature or simply PSM) pistol. Dimensionally it has a caliber of 5.45mm (.214 inch) and a case length of 17.8mm (.701 inch). The projectile is a gilding metal clad, steel-cored flat point. Projectile length is approximately 14mm with a weight of 41 grains. Muzzle velocity is a sedate 1,033 fps, which generates a lackluster 98 ft.-lbs. of energy. Despite the low velocity, the 5.45x18mm's projectile diameter and design allow it to penetrate 30 to 45 layers of Kevlar. Intended for high-ranking Soviet officers, the PSM was light and easy to carry yet still capable of penetrating the U.S. flak jackets of the period. Strengths: A small round chambered in an easy to conceal handgun, good penetration of soft body armor, mild recoil, easy to suppress. Weaknesses: Underpowered, poor terminal performance, largely unknown outside of Russia. In the 1980s, lightweight personal body armor was becoming more prevalent among Soviet units. While these flak jackets were easily penetrated by rifle fire, they were able to defeat 9x19mm ball rounds. So there was growing concern over NATO's 9x19mm weapons being rendered obsolete. Fabrique Nationale recognized this threat and began working on a solution in the 1980s, an effort that picked up steam when NATO established the CRISAT target--a 1.6mm titanium plate and 20 Kevlar folds--as a penetration standard. FN responded with a small-caliber, high-velocity cartridge called the 5.7x28mm. The cartridge's overall length is 40.5mm, and it weighs half what a 9x19mm cartridge does. To cut through soft body armor, the .224-diameter SS190 projectile incorporates a cone-shaped steel penetrator sitting atop an aluminum core surrounded by a steel jacket. Velocity of the 5.7x28mm SS190 ball load from a P90 PDW's 10.2-inch barrel is 2,346 fps. Fired from an FN Five-seveN service pistol it still clocks a respectable 2,133 fps. Despite the high muzzle velocity, recoil is approximately 30 percent less than a 9x19mm. The 5.7x28mm is capable of defeating the CRISAT target at 200 meters. Of all the small-bore cartridges the 5.7x28mm appears to be the best of the bunch. It's quite accurate, allows a high magazine capacity in a handgun, has mild recoil and is capable of penetrating a substantial amount of soft body armor. It also appears to offer an edge in terminal performance over its small-bore peers. However, many qualified individuals still question if the terminal performance of this round is adequate for military use. What becomes of the 5.7x28mm, if anything, regarding widespread military adoption remains to be seen. Strengths: excellent penetration of soft body armor, very good accuracy, mild recoil, high magazine capacity, a variety of loads available, growing more common, produced by a recognized leader in the small arms industry. Weaknesses: bright muzzle flash, untested terminal performance in military use. One little-known recent development is the 5.8x21mm cartridge recently fielded by China. For decades, the standard service pistol of the People's Liberation Army has been the 7.62x25mm Type 54. When the PLA began looking for a suitable replacement for the Type 54, it decided to replace the 7.62x25mm cartridge with a small-bore, high-velocity round. Chinese engineers believed such a projectile would yaw quickly in tissue and produce a larger wound cavity than a conventional 9mm FMJ projectile. In this way they hoped to enhance terminal performance. By pushing the small, 5.8mm projectile to above-average velocities, penetration of body armor would also be substantially improved. It was envisioned the new cartridge would be able to outperform any 9x19mm armor-piercing loads in this regard. Recoil would be light, allowing fast follow-up shots. Plus, as the cartridges would be smaller and lighter, magazine capacity would be greater, allowing more rounds to be carried. The end result of is the 5.8x21mm DAP-92. It's a small bottlenecked cartridge with an overall length of 33.5mm. The copper-washed steel case is 8mm in diameter at the rim and has a slight taper to aid reliability. Overall cartridge weight is just 92.5 grains. The cartridge is topped with a .236-inch armor-piercing projectile weighing 45 grains. The projectile features a steel jacket, a hardened steel penetrator and a lead filler in the base. The PLA claims a muzzle velocity of 1,574 fps when fired from its newly adopted QSZ-92 service pistol. The PLA says this round will penetrate a 1.3mm-thick plate of 232 helmet steel and two inches of wood planking at 50 meters. During testing performed by the PLA in 12-inch blocks of soap, the load yawed within 1 centimeter of entry and tumbled--leaving a cavity 2.5 times larger than a 9x19mm FMJ. Recoil, as to be expected, is mild. Accuracy is said to be good, with a 20-round group having an extreme spread of 2.1 inches at 25 meters. The Chinese went on to adopt QSZ-92 pistols in not only 5.8x21mm but also 9x19mm (more on that later). The QSZ-92 is currently replacing the old Type 54s still in service. The 5.8x21mm is important because it is the first small-bore, high-velocity round to be adopted by a major military power on a large scale. Whether its terminal performance is adequate remains to be tested in actual combat. Strengths: armor-piercing ammunition standard, mild recoil, very good accuracy, high magazine capacity, very good penetration of soft body armor. Weaknesses: unknown outside of China, potentially poor terminal performance. First fielded by the Soviet Union in 1930, the 7.62x25mm has seen extensive combat over the years in both submachine guns and handguns. Replaced by the 9x18mm in Soviet service in the 1950s, it soldiers on with the People's Liberation Army of China. Although currently being replaced in Chinese service, 7.62x25mm Type 54s will no doubt be fielded well into the future with certain PLA units. Based on the old 7.63mm Mauser, this bottleneck cartridge has an overall length of 1.35 inch (34mm) and a case length of .97 inch (25mm). Rim diameter is .390 inch (9.9mm). Projectile diameter is .309 inch. During its service life, the Soviets issued a number of loads in this caliber including ball, armor-piercing, tracer and incendiary ammunition. Standard ball ammunition has a projectile weight of 86 grains, with both lead- and steel-core projectiles being common. Depending upon the country of origin and application, velocities range from 1,350 fps to 1,600 fps. It is the only standard service pistol cartridge capable of defeating modern body armor when loaded with standard steel-core ball ammunition. Strengths: widely available, very good penetration, capable of defeating lower-threat-level soft body armor with ball ammunition, good accuracy. Weaknesses: no modern pistols available in this caliber, no modern armor-piercing loads in this caliber, bright muzzle flash, corrosive ammunition and lackluster terminal performance. Developed in the late 1940s, the 9x18mm cartridge replaced the 7.62x25mm in Soviet service. A squat, underpowered cartridge, the 9x18mm has seen widespread use in the former Communist bloc countries and around the world. The cartridge has an overall length of just .970 inch and a case length of .709 inch (18mm). Rim diameter is .390 inch and bullet diameter is .364 inch (9.25mm). Bullet weight can vary, but the standard Russian load drives a 95-grain steel-core FMJ at 1,033 fps. Despite a 50-year service life, this cartridge has never been popular in Soviet military or law-enforcement service due to its poor terminal performance and inability to penetrate body armor or automobile bodies. In an attempt to improve performance, the Russians developed an improved "anti-vest" load for the PMM pistol. It drives an 89-grain bullet at 1,213 fps and is said to be capable of penetrating a 3mm-thick armor plate 80 percent of the time at 25 meters. But even this slightly improved loading was not deemed sufficient, and Russia has recently adopted the 9x19mm PYa, although the 9x18 will be widely used around the world for years. Strengths: accurate and widely available in an easy to conceal and reliable platform. Weaknesses: poor terminal performance and poor penetration. The most commonly fielded service pistol cartridge around the world is currently the 9x19mm (aka 9mm Parabellum). Dating from 1901, the 9x19mm has seen combat around the world in both handguns and submachine guns. Adopted by the U.S. military in the 1980s, the 9x19mm is universally disliked by American soldiers. This is due to the lackluster terminal performance of the standard-issue M882 ball round. Although steps were taken to replace the current issue 9x19mm M9s currently in U.S. service with a modern .45 ACP, nothing came of the effort, and it appears the 9x19mm will soldier on with the U.S. military for the foreseeable future. It's interesting to note that the 9x19mm is not so unpopular on the other side of the pond. As mentioned, the Russians recently replaced their domestically designed 9x18mm cartridge with a modern 9x19mm armor-piercing load. Designated 7N21, this 83-grain load was developed specifically to penetrate modern soft body armor. The extremely light weight of the projectile allows it to be driven very fast, and the muzzle velocity is an unconfirmed 1,509 fps. It's claimed this load is capable of penetrating a 4mm thick armor plate 80 percent of the time at 55 meters. Accuracy of the ammunition is listed as an R50 of 1.1 inches at 25 meters (meaning the closest 50 percent of the shot group will all be within a circle 1.1 inches in diameter at 25 meters). Like the Russians, the People's Liberation Army of China has also recently adopted the 9x19mm cartridge. It's chambered in the new QSZ-92 pistol. The standard issue load is an armor-piercing round designated DAP-92 9x19mm. Bullet weight is listed as 123 grains, and muzzle velocity is purported to be 1,181 fps. Although the ballistics of this load appear rather ho-hum, the Chinese say its "compound core structure" (with a dual lead-and-steel core) provides enhanced penetration without the need for extreme velocity. The Chinese claim this load will penetrate a 1.3mm-thick plate of 232 helmet steel and then two inches of wood planking at a distance of 50 meters. They also claim this load yaws quickly in soft tissue, thus improving terminal performance over a conventional 9x19mm FMJ or high velocity armor-piercing projectile. Accuracy of this load is good, with 20 rounds having an extreme spread of 2.3 inches at 25 meters. Despite all the hoopla, I doubt the terminal performance of either the Russian 7N21 or Chinese DAP-92 will be any better than our M882 ball load. That said, the claimed penetration of Russia's new 7N21 load is fairly impressive. If it proves capable of penetrating U.S. soft body armor, it would provide a real advantage over our own M882 ball round. Strengths: available around the world, capable of excellent accuracy, relatively mild recoil, high magazine capacity and capable of penetrating soft body armor in specialized armor-piercing loadings. Weaknesses: mediocre terminal performance with ball ammunition, standard ball ammunition unable to penetrate soft body armor. ited to FMJ projectiles, the .45 ACP still provides the best combination of terminal performance and recoil. The weakness of this cartridge is its lack of penetration. Easily stopped by soft body armor in its standard FMJ loading, a specialized armor-piercing load would need to be fielded to enable it to defeat this obstacle. It's unfortunate that everything that makes the .45 ACP perform well against an unarmored target works against it when facing soft body armor. Strengths: good terminal performance with ball ammunition, excellent accuracy, easy to suppress. Weaknesses: poor penetration, heavier than average recoil, heavy ammo.